Item Description: Letter from Henry A. Stokes to his father. He describes Union cannonading on Petersburg. He also talks about the weather. Henry A. Stokes was a private in Lunenburg “Rebel” Virginia Light Artillery Battery. I now take my seat to answer your letter which to hand several days ago, would have answered it before now but have not felt very well for the last few days, had quite a bad cold, but have at last gotten entirely well. Times are so dull about here now that I have no news to tell you. Heavy cannonading was heard in the direction of Petersburg yesterday evening and continued till late last night, but the result has not been heard from as yet; we supposed that they (the Yanks) were shelling P…….. but do not know. 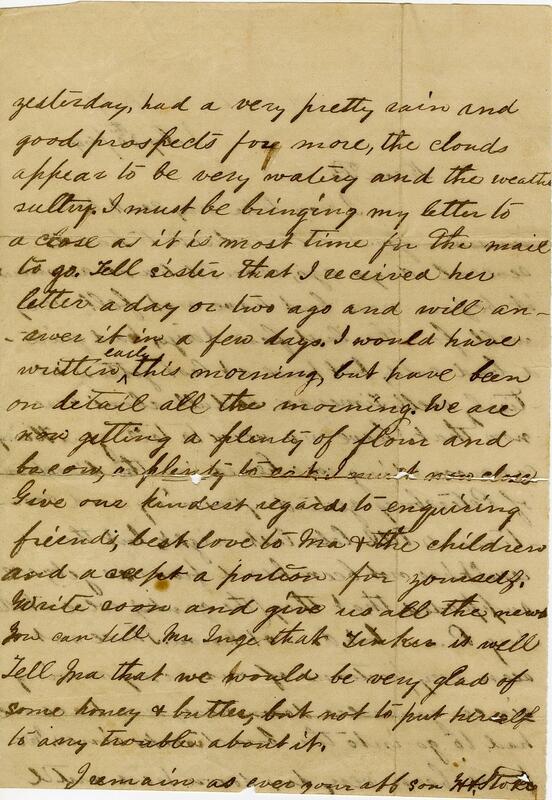 I have not seen any portions of our army moving since you were down here, nor have we had to go into the breastworks since we have been very dry down here until yesterday, had a very pretty rain and good prospects fore more, the clouds appear to be very watery and the weather sultry. I must be bringing my letter to a close as it is most time for the mail to go. Tell sister that I received her letter a day or two ago and will answer it in a few days. I would have written early this morning, but have been on detail all the morning. We are now getting a plenty of flour and balow a plenty to eat. I must now close. Give our kindest regards to enquiring friends, best love to Ma and the children and accept a portion for yourself. Write soon and give us all the news. You can tell Mr Inge that Tinker is well.Tell Ma that we would be very glad of some honey and butter, but not to put herself to any trouble about it. 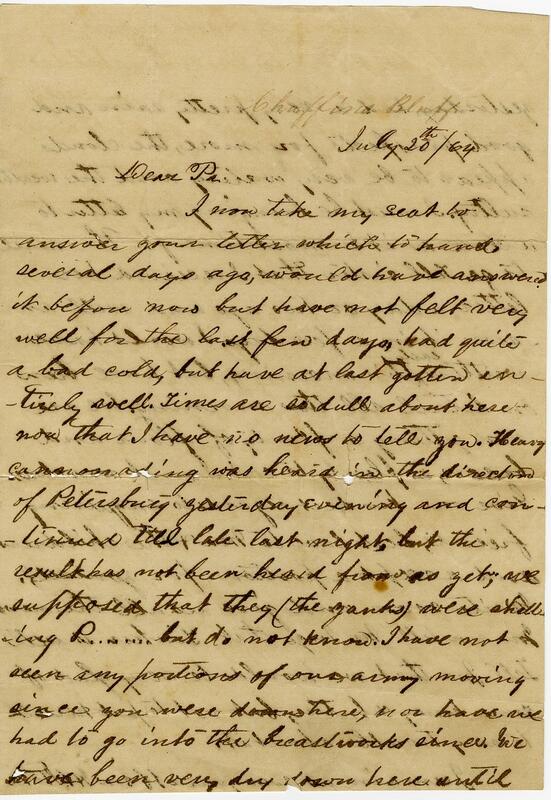 This entry was posted in Southern Historical Collection and tagged cannon fire, Chaffin's Bluff, Civil War, Henry A. Stokes, Link Family Papers, Lunenburg "Rebel" Virginia Light Artillery Battery, Petersburg (VA), Virginia. Bookmark the permalink.